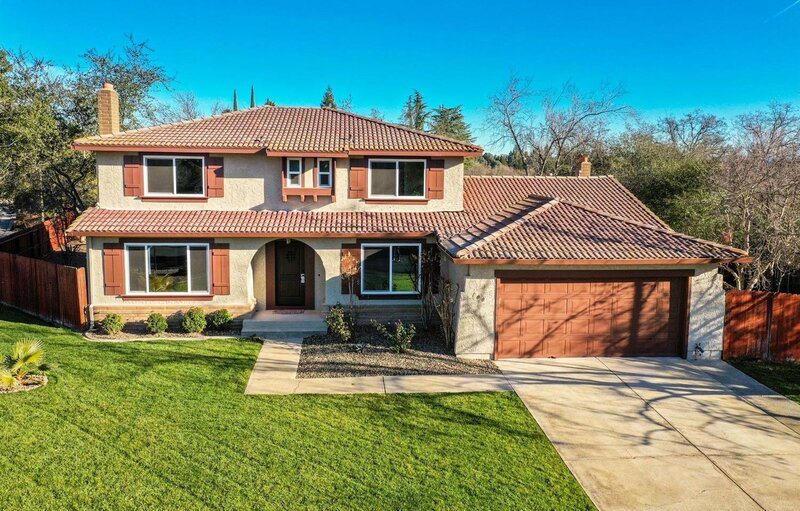 Gorgeous home in a highly desirable American River Canyon area. Recently remodeled with many custom upgrades and modern touches. New classy wide plank wood laminate floors in combination with fresh interior cool crisp colors give the home a sharp modern look. Natural beauty of new top to bottom stone surround of two magnificent fireplaces brings drama and romance to family and living rooms. Bathrooms are upgraded with new sparkling quartz counters, white vanities, sharp tile floors and tile surround for a feel of luxurious comfort. New windows, doors, custom railings, beautiful front landscaping ... all installed in 2018. Specious newer kitchen boasts gleaming granite counters, shaker style cabinets and stainless steel appliances. Kitchen opens to the family room and on the other side connects to the dining area. Both rooms have access to the large private backyard with covered patio. The property sits close to the picturesque Hinkle Creek Nature Area. Perfect for comfortable living! Listing courtesy of Sheremet Realty. Selling Office: Keller Williams Realty Folsom.